iDog is a little dog with a big sound. 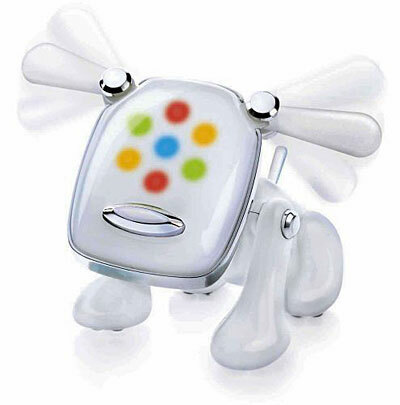 iDog Rocks to your music. And when you plug it in, it even plays your music. With a built-in speaker, an array of moods, and a personality that changes with the music you feed it, iDog is a faithful music companion. Included cable plugs into your music player so you can play tunes through iDog. Listen to your music through your headphones while iDog rocks out or simply place it near a speaker and watch iDog move and groove to the beat. Flashing lights change color depending on the type of music you play. Changing light patterns respond to your touch or the amount of music your feed iDog to express moods. Compatible with most portable and non-portable music players.